To make them I used a sugar cookie dough and a diamond cookie cutter for the kisses (using a knife to cut the diamond in half:). For the chocolate, unwrapped cookies~ Melt about 2 dozen Hershey's kisses (with about a tablespoon of shortening added) in the microwave. Pour the melted chocolate into a pastry bag (I used a disposable bag). Let the bag cool for a short bit in the fridge. With the decorating bag(and a #3 tip), simply apply the chocolate to the cookies by outlining (to look like a chocolate kiss) and immediately filling. Let dry. For the "wrapped" cookie~Tint some royal icing gray, outline the cookies(I used a #3 tip) and immediately fill. While the icing is still wet adhere a small piece of the Hershey's kiss tissue tag on the very top edge of the cookie. Immediately after, sprinkle with some silver sugar (I used Betty Crocker's Silver Sugar Cupcake Gems). Let dry. I left them overnight to dry and then shook off the loose sugar. TA DA! That's all there is to it! Cute and tasty little cookie bite kisses for any day of the year! Yes, that's it! Thank you Sparkling Sugar Sweets! So cute.... Happy Valentine's Day! Those are so cute!!! Hope you're having a sweet day! These are adorable Sue! Perfect! I would much rather eat one of these than a regular chocolate kiss! Those are great! You're so creative. I think I really would like these more than the actual Kisses! So clever! They look delicious too! Can you send some over via blogsville? If only! heehee! I went for the wrapped version!!! These are adorable as always!!! Your creations never fail to make me smile!!! That would be the only time I'd let my kids eat their candy with the wrappers on! SO cute!! These cookies are adorable!! Perfect for a sweet little treat. You are so creative Sue! What a clever idea to use a diamond shaped cuter. Love them! I'm always amazed how you keep coming up with the cutest treats ever. These are so very cute! I just shared the link on Twitter--what a fun idea! Thanks for sharing at oopsey daisy! My little girls would LOVE this! Thanks for the inspiration! You're amazing. Those are probably the cutest little cookies I have seen, they look yummy! They are perfect for little hands, well they would be great for big hands too, to just grab a few. I'm officially in LOVE with these cookies! Oh my gosh!!! Those are aDORable! The "wrapped" ones are my fave! Would you share them here? Pleeeeease? I think I gained weight just looking at your blog - everything looks so good!!! These are so cute! What a clever idea! oh my word...these are seriously adorable!! 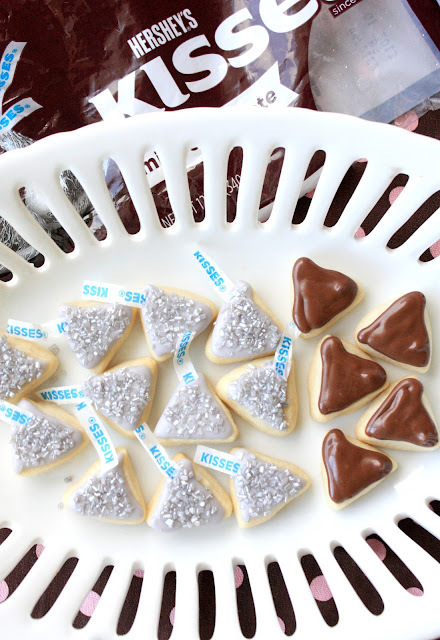 I love that you melted the Hershey's kissed and used them to decorate some of the cookies! So cute! i can't wait to make these. I'm your newest follower. Stop by and visit me sometime at http://feedingfourfood.blogspot.com.